Tonight’s going to be a fun night. I’m attending Feed the Soul at the Warehouse, with soul food, Raiford DJing, and live music by Earl Randle and the Ryan Peel Band. There will also be a bourbon tasting, oxygen bars, and more. You can get your tickets to Feed the Soul here. Proceeds benefit one of the most worthy charities in the city, MIFA. Meanwhile, over on Mud Island, the Black Crowes bring their “Say Goodnight to the Bad Guys” tour to the Ampitheater. Should be a big party night in Downtown Memphis. I had a good time chilling with friends last night at the Saucer… just a nice, relaxed time, good conversation without anyone interrupting us or hovering behind us. While we were there the new fall menus came out, and I immediately noticed a change… “Monday Night is Pint Nite! Almost all drafts $3.00.” Yep, they’re going up a quarter. I guess it’s not too bad, though. Other bars in the area – Bardog, South of Beale for example – already charge $3 on their respective pint nights. The price increase won’t stop me from coming, because it’s still a bargain – I’m at 166 beers done toward my next plate, and I still have enough Pint Nite beers left to get to about 180. That’s all for now… not a whole lot of news today. Hope to see you at Feed the Soul tonight. If you’re not doing that or the Crowes, don’t forget there’s a line dance flash mob in front of BB King’s. 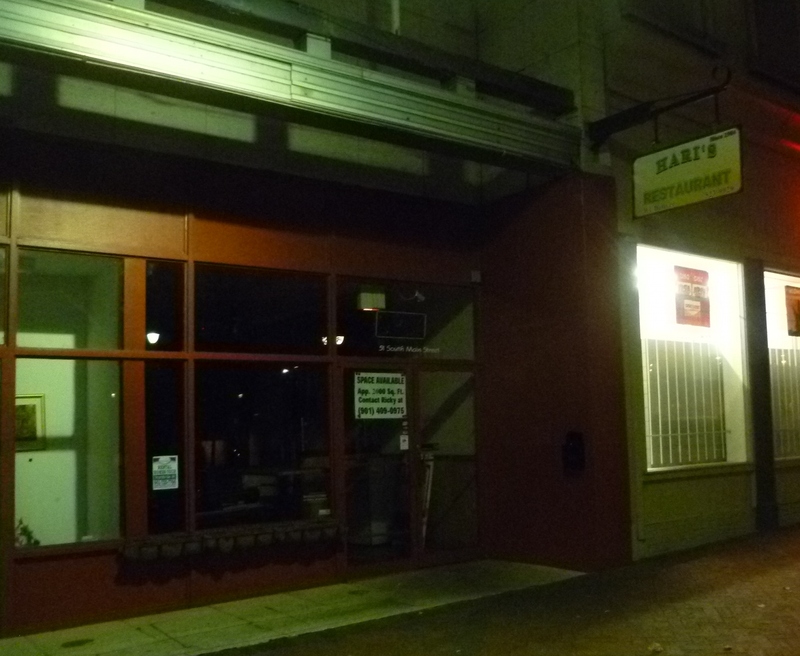 I’m sad to report that Hari’s at 51 S. Main has closed. Sad to hear it because I loved to go there on weekends and vacations and get some Indian food. I’m going to say it – people looking to start a business should leave that building alone, unless it’s a “name” business like the Blue Monkey was when it came Downtown. A “name” business has the potential to fire off development on that entire block. An unknown business, good as it may be, has to deal with the issue of getting people in the door. I wish that’s not the way it was. But it is. Blue Coast Burrito would make a killing there. Just sayin’. There will be a line dance flash mob on Beale Street tomorrow night. The event is to celebrate Preston Shannon’s appearance at Treasure Coast Blues Festival in Port St. Lucie, Florida on November 6. Participants will practice the dance, the Shuffle Boogie Soul, from Shannon’s “Honky Tonk” (see the video here) from 5 to 6:30, and filming will begin at 7. The footage will be combined with footage from similar dance mob events around the word. The mob will happen in front of BB King’s. For more info contact Kearta Knox at ks.knox@hotmail.com. Mesquite Chop House is getting in on the “buy the beer, keep the glass” night action. Tonight at the restaurant, buy a pint of Newcastle for $5 and keep the glass for free, from 6 PM until they run out. Try some of Michael Patrick’s delicious cuisine while you are there! One of my blog readers has an apartment to rent, and asked me to give it a mention. It’s not Downtown, but it’s close, in Midtown at 199 N. McNeil. It’s a 1 BR/1 BA 1,000 SF apartment with luxury amenities, stainless steel in the kitchen, Jacuzzi hot tub, and new HVAC system. $950/mo rent includes all utilities, as well as cable (400+ channels including HBO, Max, Showtime). Pet friendly. This is someone I know personally and I believe she’d be an excellent landlord; if interested check out this listing for more info, photos, and contact information. That’ll wrap it up for now, lunchtime. Think I’ll try Maria’s again, since it’s the only place I know of in Southaven/Horn Lake that has the Memphis Flyer. I saw an interesting Twitter account today – @foodiememphis. The bio for the account reads, “Open dinner group for Memphians or visitors, looking for interesting company & great food. Promoting unity & local restaurants, 1 passed dinner plate @ a time.” Sounds good. I followed it. Apparently this is a pretty new Twitter account. They’re having their first meetup at Fuel tonight. Tomorrow is the last night for Bikes on Beale, where motorcycle enthusiasts bring their rides to Beale and park on the street. Friends of mine who ride motorcycles and scooters have a lot of fun at this, so come check it out if you own one. Lansky 126 tweeted that they are hiring a full-time sales associate. This would be a great opportunity for someone wanting a career in retail. Not only would you be surrounded by the history of the Peabody and the Lansky clothing line, but you’d get to learn from the Lansky family who are some of the best salespeople around. E-mail sales@lanskybros.com for more info. 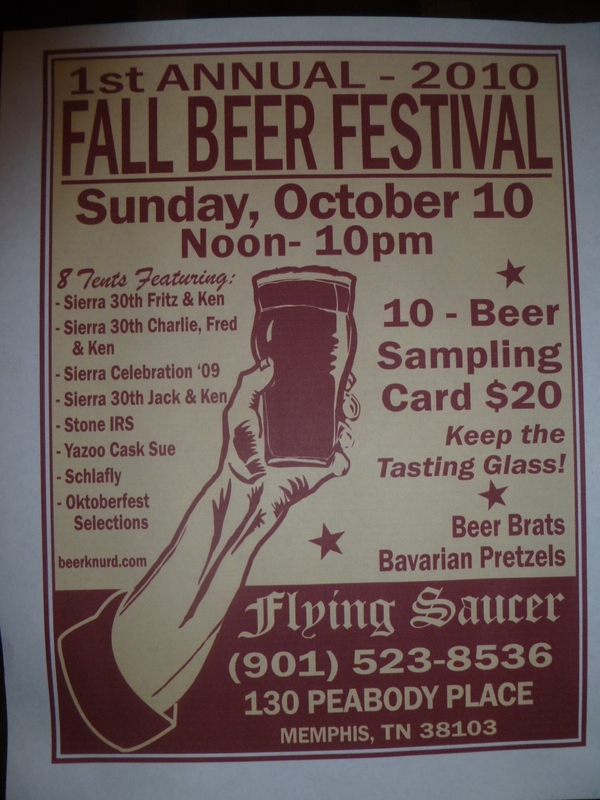 Here’s a Memphis Flyer article about the Cooper-Young Regional Beerfest to happen October 9. I have my ticket. Do you? Also on the Flyer’s website: Downtown Dining Week returns November 15-21. You’ll be able to get a three-course meal at some of Downtown’s nicest restaurants for only $20.10. That’s up a penny from last year, but you know, inflation. As soon as the CCC get’s this year’s DDW site up, I’ll link to it and we can see what the choices are. At the risk of sounding like the Nuh-Uh Girl, that’s my birthday week, who’s buying me dinner? The Grizzlies will have a free public practice Sunday. Fan Fest with the Grizz Girls and kids’ activities 1 to 2, practice 2 to 3, and afterward players, coaches, and front office people will answer questions and sign autographs. More details here. That’s all for the afternoon recap… gotta copy some photos to a memory stick, then it’s time for trivia at the Saucer. The South Main Association’s annual Oktoberfest celebration, to be held from 3 to 7 PM on Sunday, October 10, will be their biggest Oktoberfest yet. In past years it’s been held on the lawn outside Harry’s Detour. This year, it’s expanding out into the street – G.E. Patterson Avenue will be blocked from Main to Mulberry for music and dancing. They will also have musical entertainment this year, as Pam & Terry will perform from 3 to 6. Pam & Terry are a staple on Beale Street on Saturday afternoons, and they entertained crowds at Sleep Out Louie’s every Friday night for years. Beer and wine will be provided by Ghost River and the Corkscrew. 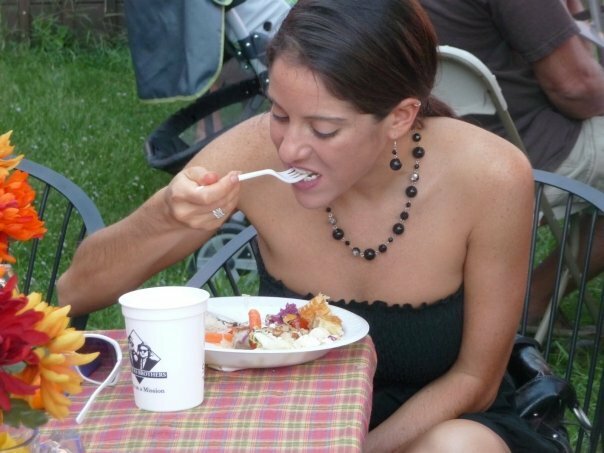 Delicious Oktoberfest food will be served by Harry’s Detour and Circa. Free food? Wonder if the Nuh-Uh Girl will show up. The event is free for SMA members. If you’re not an SMA member, you can partake for $10, but you might want to think about paying the full membership price of $35 to join. It’s not hard to make your money back in terms of food and beer consumed over the year, with several parties throughout the year, burgers and Ghost River beer at Trolley night, and free hors d’oeuvres at most monthly meetings. They’re asking people who plan on attending to RSVP, so they can be sure to have enough beer and brats for everyone. RSVP to info@southmainmemphis.net with “South Main Association Oktoberfest RSVP” in the subject line. If you want more info about Oktoberfest, or if you want to go ahead and join the SMA online, here’s a link to their website. WOW… it wasn’t until last night that I realized that SMA Oktoberfest and the Flying Saucer’s beer festival are on the same day. Luckily, the Saucer’s event starts at noon and continues to 10, so it’s definitely possible to do both. With the Cooper-Young Regional Beerfest the day before, it’s going to be a beery weekend. I’ll do the usual “daily update” post after work, so check back. I was at the Saucer for Pint Nite and Monday Night Football tonight, and my friend Eric was there too. The Saucer does $25 halftime trivia on MNF nights, and we decided to play as the Rapscallions. On Tuesday, other trivia teams should fear the Rapscallions, because we usually win or at least get top three. Monday? Not so much. We got one half of one question right, but they don’t do partial credit on Monday. Eric, displaying a lot more sense than I had, left before the results were even announced. I did have fun showing off the bite mark Kelly AKA “Pit Bull” AKA “Crocodile” AKA “Shark” left on my arm Sunday. A day off + a sister celebrating an upcoming wedding + an enabling mother + 6 hours of vodka led to my bite wound. She better hope I don’t post pics. Earlier today I mentioned Monday Night Football at Kooky Canuck among the list of possible things to do Downtown tonight. Scratch that… Kooky put up a “please pardon our dust” page on Facebook today, saying that they’re going to be closed a few days for repairs. They will reopen Friday, October 1 at 11 AM. LifeHacker posted today about a service called Rescu.me that could be very useful for people who hang out at Downtown bars. Have you ever been trapped by someone in uninteresting, mundane conversation and you feel like they’ll never shut up? And then finally they do, and you get ready to go back to enjoying your drink, when they go, “Well, you know, I was watching TV or something the other day, and…” and start another long conversation thread. 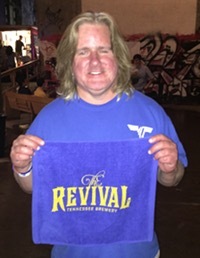 Well, you think, at least their beer is almost empty, and they’ve said it’s their last one… and then they go, “You know, I think I’m going to have ONE MORE.” Rescu.me can rescue you. You text “SMS 5 (text of message)” to 206-866-5924 and it will send you that message in 5 minutes, and you can pretend to have an emergency that has to be taken care of. You can substitue another number for 5 for a different number of minutes, and you can substitute CALL for SMS to have the service call you instead. For best results, Lifehacker recommends putting Rescu.me’s number, 206-866-5924, in your phone, so that it will look like someone you know is contacting you. More info here. This CNN story has more details on the Southwest/AirTran merger. Southwest has said they intend to keep their single class seating, no fees for baggage, and open seating across all their flights. Sounds very, very promising for improved air service to Memphis. Again, though, these things can take years to sort out, as the merger would have to receive the approval of the Justice Department. Time for Pint Nite! Beers number 161, 162, and 163 toward my next plate. Potentially good news for Memphis this morning. One of the best airlines in the world, Southwest, which does not serve Memphis, is buying out one of the worst airlines in the world, AirTran, which does serve Memphis. This MBQ article suggests that Southwest will probably operate all the routes under one brand, and therefore it’s possible will finally get Southwest in Memphis. Too early to know for sure, though. I hope they come… when I had my business trip to New Orleans back in July, I canceled my plane ticket and drove when I saw I’d be flying AirTran. Had it been Southwest I would have flown. If you haven’t eaten yet and you’re trying to decide where, may I suggest Chili’s? 100% of profits today got to St. Jude. The CCC is offering a $1000 cash prize to the non-commercial entity or group of individuals with the best entry in this year’s Memphis Holiday Parade. The parade will take place on Saturday, December 4 at 5 PM. “Entrants are encouraged to pull out all the stops,” the CCC wrote, “Costumes, face paint, blinking lights, and DIY floats or other creative modes of transportation – anything with high visual appeal. Unusual or themed entries are welcome.” Go to memphisholidayparade.com for more information. The Flying Saucer is giving away its annual Beer Knurd calendar tonight to UFO members. Each month features a pic of a different Saucer location, with one of the location’s main regular posing with their favorite Saucer girls. I know who is featured from Memphis, and while I won’t give away the surprise, they’re two very nice people who I’m always happy to see when they’re in town. The Saucer says, “Come early, when they’re gone they’re gone,” but if I remember last year, they were pushing those calendars on anyone who would take them for a good month or so. Then there’s the usual other Monday night stuff going on: Half price pizza and wine at Spindini, Texas Hold’em at the Silly Goose at 9 and 11:30, deals on wings and Bud Light at Kooky Canuck during Monday Night Football. As usual, I’ll be at Pint Nite about 6. Last week I blogged about Feed the Soul, the fundraiser celebrating MIFA that will happen Thursday night at The Warehouse on G.E. Patterson. One of the organizers contacted me and asked if I wanted to be put on the list +1, and I’m not one to turn down a chance to party at The Warehouse, one of the most awesome venues in Memphis. Since I have the +1 I guess I should try to find a date… if I have any stalkers out there, now would be a good time to reveal yourselves… female, cute, and hopefully not psycho is what I’m looking for. Seriously, though, this should be one of the best parties of the fall season. There will be soul food by Chow Time, an opportunity to get photos made on the paparazzi walk, Raiford in the DJ booth, music by the Ryan Peel Band and Earl Randle, raffle drawings, a bourbon tasting, a vodka luge, oxygen bars, and more. If you want to buy a ticket you can do it here. Should be a really fun evening – hope to see you there. Ah… sleep, sleep, wonderful sleep. Got a full 9 hours last night. That hasn’t happened a lot the past few months, since my next door neighbors got two little barky dogs. As early as 5 in the morning some days I start hearing ARF ARF ARF. Nearly everyone on my floor (at least the people I’ve talked to) hate those dogs. This morning, though, they were quiet. Maybe the neighbors donated them to a high school football team to use for kicking practice. Or stuck them in the microwave to see what would happen. Who cares… at any rate, glad not to have heard them for once. I took some pics of signs and flyers for upcoming events while I was out this weekend. Sunday, October 10 looks like it’s going to be a big day. The Flying Saucer will have an outdoor beerfest on the 10th, with some beers not normally on tap at the bar. $20 for a beer sampling card. Wow… with the Cooper-Young Beerfest the day before, that’s going to be a big weekend for beer drinking in Memphis. Needless to say, I plan on doing both events. 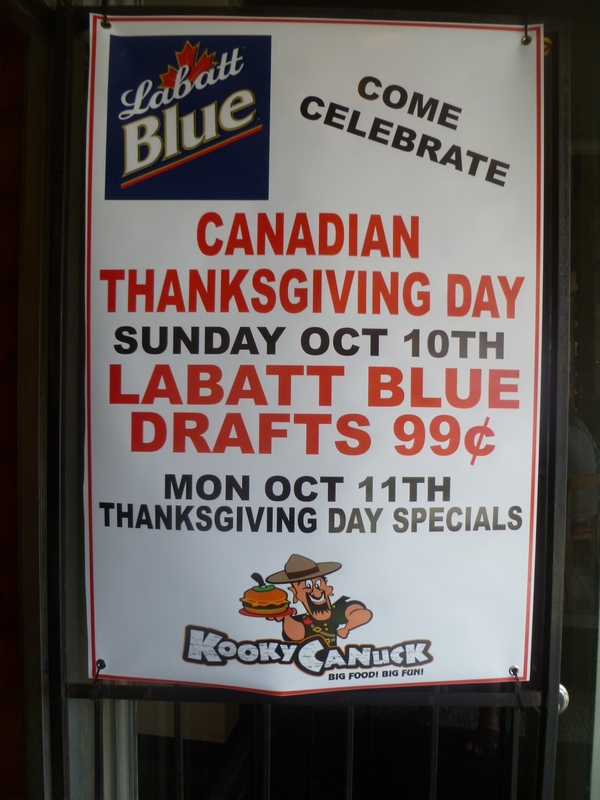 Kooky will have 99 cent Labatt Blue on the 10th to celebrate Canadian Thanksgiving, and then Monday there will be food specials. I know turkey for Thanksgiving is kind of an American thing… I wonder what Canadians eat? Moose maybe? I’ll have to ask Shawn next time I see him. I watched the Arkansas-Alabama game at Max’s (formerly Calhoun’s) yesterday and had a really good time. The place was loaded with Hog fans and the place exploded when Mallett completed a pass for a touchdown 50 seconds into the game. Too bad the Hogs couldn’t hold on. For the first 45 minutes they looked like a team that could hang with anyone in the country, and in the fourth quarter they just couldn’t handle the pressure. Congrats to Bama on a good game. As I’ve said before, I’ve always liked them. Hopefully the Hogs can recover, not lose another game this season, and have a chance at getting to a BCS bowl. I wonder how far we’ll drop in the rankings? 16 maybe? There was still a silver lining for me concerning yesterday’s game… while it was on, people got on my College Logo Shopping site and bought stuff, so I made commission while sipping a PBR and watching TV. Arkansas fans bought more stuff than Alabama fans (someone bought a $164.99 Razorback cooler), so at least the Hogs won that battle. I saw on Twitter last night that Local Gastropub has added a TV with 100″ projection screen. So if you like watching football on a really big screen, that would be a place to go. The next part of this post requires me to fire up my painfully slow 2006 laptop to grab a pic… wow this thing is taking all of 7 minutes to boot. Glad I have a MacBook now. Last night was a sad night at the Saucer, as one of my favorite bartenders ever worked her last shift there. Jessie (on the right in the pic above, at our BBQ Fest ’09 booth with two of her best girlfriends) is one of the sweetest people ever. She will most definitely be missed, although I can’t blame her for moving onward and upward. Don’t be a stranger! Hair color update… I now have it back to medium brown without any adverse effects from dyeing it black for the Elvis pub crawl. Next week or the week after, I’ll dye it medium golden brown, which is only one shade darker than it was before, and let the sun fade it back to the old color. Nikki will be happy that she has “her” hair back. Susie will be happy too. Getting ready for Sunday Fun Day, which I have a feeling will be extra fun this week. May post again later, we’ll see.